The Monastic House “Theotokos Joy of the Grieving”, is located in village of Palaiochori Chalkidiki, close to the outter limits of the village, next to the highway that leads to the village of Megali Panagia. It is a mens monastery. It was founded in 1999 by Dean Ignatios and his entourage, and is a labour of special reverence towards the Mother of God and Saint Athanasius the Athonite, whose chapel preexisted in the area. The monastery celebrates on the 5th of July which is the feast day for the commemoration of St. Athanasius the Athonite. 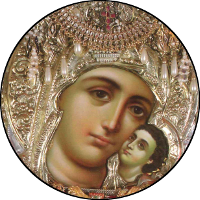 Gatherings are held for the miraculous icons of the Theotokos that are treasured in the monastery. The gathering for the icon “Theotokos «Joy of the Grieving»” is held on the Sunday of the Holy Myrrhbearers (The second Sunday after the Feast of Holy Pascha) followed by a Holy Vigil. The gathering for the icon “Theotokos «The inexhaustible chalice»” is held on the 18th of May. A festive solemn Divine Liturgy is held on Easter Week Friday, the Litany of “Theotokos Joy of the Grieving” takes place outside the monastery, and the sanctification and the blessing of the gardens is celebrated along with the wishes of Saint Tryphon.